Moroccan Mosaic Bistro Table with andalusian tile work. Can Be Used In Door Out Door And Can Set 2 To 8 Peoples. With Wrought Iron Stand Include. EXXOT DESIGN decorative Moroccan mosaic tables. Their live colors and patterns make them easy to fit indoor or outdoor. Add to them iron bases and chairs for dining, bistro, coffee, and patio selection to fully enjoy the artistic and exotic mosaic ceramic table set. 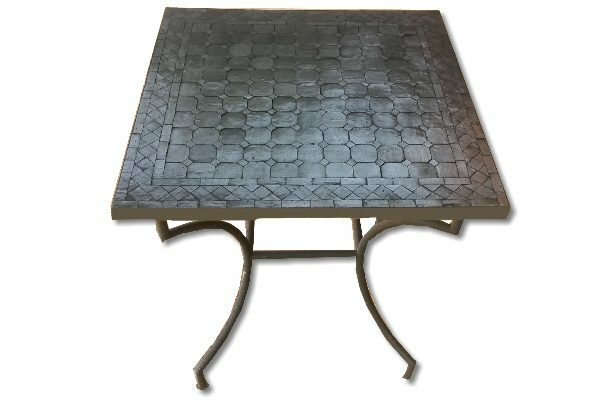 Our tables come in different sizes and shapes: mosaic square, round, rectangular, and half moon design. With colors that range from brown-beige, multi-colored, green-blue, blue-white, burgundy-terracotta, all hand made with the same Zellij, and Andalusian, and Alhambra techniques. The terms is Ex-Work Marrakech- Morocco and the delivery date is about 30 days after receipt 50% deposit and balance T/T payment before shipment.